Water levels in the South Pacific are continuing to rise due to climate change caused by greenhouse gas emissions. The small island nation-state Tuvalu, along with other islands in the region, could be completely submerged if sea levels continue to rise. Habitat loss and the possibility of relocation are major concerns among Tuvaluans, as they face the potential loss of their culture as well. The Prime Minister of Tuvalu has pushed for international attention to the threat of climate change and specifically called for more nations to sign the Kyoto Protocol. The future of Tuvalu lies essentially in the hands of those who produce high quantities of greenhouse emissions, which tend to be the larger, more developed countries on the opposite side of the globe. This issue is putting major pressure on Tuvalu to make resettlement arrangements in the event that the island is overcome, however the task is proving to be difficult considering the costs of relocation and the reluctance of Tuvaluans to leave their native land in fear of losing their distinct culture. Unfortunately, it seems that Tuvalu is running out of options, and scientists are predicting that the country may no longer exists before the end of the 21st century. Tuvalu is one of the smallest independent nations in the world. It consists of nine coral atolls in the South Pacific Ocean, and has a population size of roughly 12 thousand people . Though its island structures vary in elevation and fragmentation, all have poor soils and limited vegetation. Tuvalu experiences resource issues such as portable water, and other necessities are provided and relied on through storage systems and imports. Despite some limited economic growth in the 1990's Tuvalu still remains heavily dependent on foreign aid for development capital and technical assistance. Remittances contribute to more than 20 percent of the national income . The settlement and language of Tuvalu goes back about 2,000 years. It is generally believed that the earlier ancestors came mostly from Samoa, possibly by way of Tokelau, while others came from Tonga and Uvea (Wallis Island). These settlers were all Polynesians with the exception of Nui where many people are descendants of Micronesians from Kiribati. In 1986, off the northern shore of Nanumaga, scuba divers investigated a local legend of a "large house under the sea". They found and underwater cave more than 40 meters down the wall of the coral cliff. Inside the cave there was evidence of ancient human occupation more than 8,000 years ago, which is sharply at odds with the general view that the Pacific was settled just 4,000 years ago. According to modern scholars the population of Tuvalu before 1900 was never more than 3000. These opinions are based on early missionary reports and on careful estimates of the population-supporting capacity of Tuvalu food resources. There are three distinct linguistic areas in Tuvalu. The first area contains the islands of Nanumea, Niutao and Nanumaga. The second is the island of Nui where the inhabitants speak a language that is fundamentally derived from I-Kiribati. The third linguistic group comprises the islands of Vaitupu, Nukufetau, Funafuti and Nukulaelae. Today, Tuvaluan and English are both spoken throughout the islands . There is climatic evidence of a massive rise in sea level that began 18,000 years ago, and stopped about 4,000 years ago. It is possible that this rise may have drowned artifacts of human migration to Tuvalu and other Pacific Islands . The first European Explorer to make contact with Tuvalu was Alvaro de Mendana y Neyra, a Spanish explorer. He sailed westward across the Pacific in 1567-8 to discover, explore and name a substantial part of the eastern half of the Solomon Islands. On January 16, 1568 Mendana, with his ship Capitana, sighted his first island, which turned out to be Nui, and named it the Isle of Jesus. Although islanders ventured out to the ship no contact was made with them. A quarter of a century later Mendana once again obtained ships and men to make a second exploration of the Pacific. On August 29, 1595 the atoll of Niulakita was discovered and named La Solitaria. Once again no contact was made and Mendana sailed off in search of the Solomons where on Santa Cruz, he died in October 1595. Such was the first and only European contact with Tuvalu for almost two centuries. The atolls were ignored until 1781 when the Spanish trader Don Francisco Maurelle was forced well south of the Equator by unfavorable winds on a routine journey from Manila to Mexico  . Captain Arent de Peyster, an American, is given credit for the rediscovery of Tuvalu. He was in command of the British brigantine Rebecca, who in May 1819 discovered a group of fourteen islets which appeared to be inhabited. The first atoll was discovered when the Rebecca was only three times her length from the shore. That he avoided shipwreck was fortunate whilst the problem of visibility, plus the isolation of Tuvalu, indicates very clearly the reason for its belated discovery. 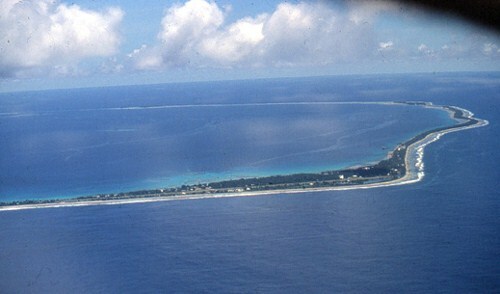 The atoll was Funafuti and de Peyster called it Ellice's Group after Edward Ellice, the Member of Parliament for Coventry and the owner of the Rebecca's cargo. Eventually, the name Ellice was applied to all nine islands by the English hydrographer A. G. Findlay  . In the next decade more traders and whalers briefly visited Tuvalu, especially after the discovery of the Central Pacific whaling grounds in 1818. Although few left record of their journey, they did serve finally to establish the location of the atolls on the map of the Pacific. American whalers frequented Tuvalu’s waters in the 1800's. Seamen occasionally deserted and settled ashore, while some of the more adventurous islanders became crewmen. Some Europeans beachcombers become traders and agents for firms in Australia, Germany and the US, and organized the export of coconut oil or copra. During the 1860s slave traders carried off about 400 islanders, mainly from Funafuti and Nukulaelae, to work in Peru. None of them ever returned. Others were later recruited for plantations in Fiji, Samoa and Hawaii. European diseases caused many deaths among the islanders . Formerly called the Ellice Islands, Tuvalu came under British jurisdiction in 1877 and was made part of the British Protectorate of the Gilbert and Ellice Islands in 1892. 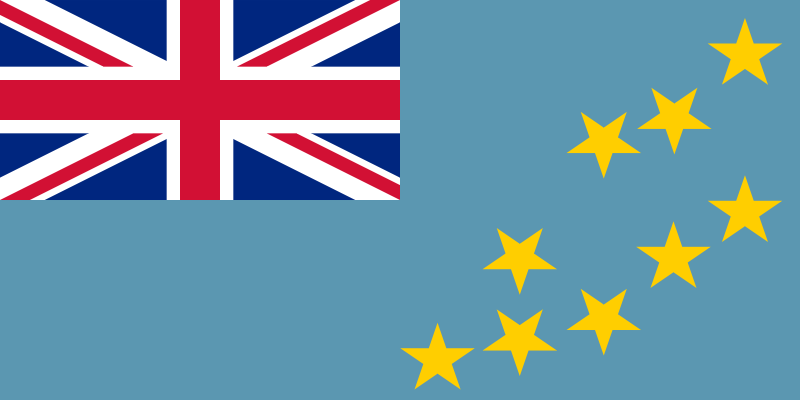 In 1890 the British High Commissioner for the Western Pacific based in Fiji recommended the acquisition of the Gilberts by Britain, not only to forestall possible action by Germany, which in 1891 itself urged Britain to declare a Protectorate to forestall the USA, but also to control the recruitment of labor, the sale of guns and liquor and to end the growing turbulence within the group. In 1892 the British Government, realizing by now that failure to declare a Protectorate would probably lead to acquisition by Germany, despite an 1886 agreement with that country, or by America which was not a party to the agreement, ordered the Commander-in-Chief, H.M.Ships, Australia, to send a warship to the Gilberts to declare a Protectorate. Captain Davis, R.N. of H.M.S. Royalist was sent to carry out this task. Captain Davis had been ordered to visit the Ellice Islands but not to declare a Protectorate there. He reported that the 'Kings' of each island had asked for a Protectorate to be declared and Captain Gibson R.N. of H.M.S. Curacao was thereupon ordered to the Ellice Islands in 1892, and on each he declared a Protectorate between the 9th and the 16th October. On 10 November 1915, the group became the Gilbert and Ellice Islands Colony . After World War II many Tuvaluans migrated to Tarawa, the reinstated capital of the Gilbert and Ellice Islands Colony. There were better opportunities for employment, mainly due to rebuilding after the terribly war. They found employment opportunities exceeded their numbers; one reason being that their education system continued during the war, while that of the Gilbertese did not, due to the Japanese occupation. This lead to rivalries within the civil service, and an assertion of Gilbertese rights . Britain prepared the colony for independence by granting self-government in 1974. However, the Ellice Islanders were not pleased at the thought of having their ruling masters changing from the British to the I-Kiribati, and began seeking ways for secession. The British conducted a formal inquiry into Tuvaluan attitudes towards secession, and announced that a referendum was to be held, in which Tuvaluans could choose to remain with the Gilberts or secede from them. They are told beforehand that if they separate they would not receive any more royalties from the Ocean Island phosphate or other assets of the colony. Despite this, 3799 Islanders (92%) voted to secede, while 293 voted against secession. On October 1,1975, legal separation from the Gilbert Islands (now Kiribati), took place. On January 1, 1976, full administration of the new colony was transferred to Funafuti from Tarawa. Tuvalu became an Independent Constitutional monarchy and the 38th (special) member of the Commonwealth on the October 1,1978. In 2000, Tuvalu became a full member of the Commonwealth and the 189th member of the United Nations . Global warming poses a potentially hazardous scenario for atolls, because the rise of mean sea level caused by the greenhouse effect would progressively increase flooding and the impact of storm waves. Coastal erosion would also heighten, and would lead to land losses and a decline in agricultural production. Competition for scarce land and reduced availability of resources, compounded with population growth, could create future internal conflict and evacuations  . Sea level rise is a constant presence in Tuvalu. Waves crashing just a meter from the main road bring rocks and debris, slowing traffic and endangering lives. Many homes are flooded during high tides. Heavy storm activity is also a major problem for Tuvalu, and as sea temperatures rise, intense weather events may become more frequent . In January and February of 2006, Tuvalu experienced some of the highest tides, nearly reaching five feet above average sea level. The floods are caused by "king tides", which are the highest tides of the year . These tides undergo natural short and long-term cycles, but were theoretically boosted by the effects of global warming. These highs are pretty alarming considering the highest ground in Tuvalu is just 16.5 feet above sea level. If global sea levels rise as predicted, the 12,000 Tuvaluans will be among the first to see things go awry. Increased seawater flooding would accelerate coastal erosion and threaten Tuvaluans' food and housing. In short, Tuvalu would become uninhabitable . Traditionally, sea level was measured with tide gauges and more complex devices that produce continuous graphic descriptions of tide height over time. By the 1990's, satellites began generating more comprehensive profiles of global sea levels . According to these satellites, the average global rate of sea level rise has increased 50 percent in the last twelve years. Experts attribute rising sea level to the expanding of the ocean, caused by ocean warming and glacial melting. Scientists estimate that more than a hundred million lives are potentially impacted by this increase in sea level . Even though the visual effects of climate change are clear to any visitor, scientific data cannot provide concrete evidence that global warming is the main cause of Tuvalu's dilemma. Phil Woodworth of the Proudman Oceanographic Laboratory in Liverpool has studied high tides in the Pacific to see whether they have changed since the 1970's; he claims that the peaks seem to be increasing, but by no more than mean sea level . Thus, the extremes at Tuvalu could be caused primarily by the slower changes in the oceans due to El Nino/Southern Oscillation (ENSO) and the long-term changes in mean level. Scientists are saying that it is too early to rely on numbers for concrete answers . The greenhouse effect is a natural phenomenon that maintains the earth's temperature. Heat-trapping gases in the atmosphere absorb sun light, which creates an insulating layer that controls the temperature of the Earth . Without the greenhouse effect, temperatures on Earth would be so extreme that the planet would not be able to sustain life. Global warming occurs when the Earth's temperature rises as a result from increased heat-trapping (greenhouse) gasses in the atmosphere. Though atmospheric gases cause some of the increase naturally, global warming is predominantly caused by anthropogenic activities that release large amounts of gases and pollutants into the atmosphere . These gases are caused by emissions from industries and factories, fossil fuels from automobiles and other modes of mechanic transportation, and deforestation. As the concentration of these gases grow, global warming quickly increases, and this impacts changes in climate which can bring unusually intense precipitation, severe storms, dry spells in areas that were never arid, and the melting of polar ice caps which creates rises in sea levels. Scientists predict that even if populations stopped emitting greenhouse gases immediately, the climate would not stabilize for many decades because the gases already released will remain for years or centuries . In 2000, Tuvalu joined the United Nations to highlight their concerns about climate change. Tuvalu's Prime Minister Maatia Toafa was distressed that the capacity for action was limited to Tuvalu's own shores considering most of global warming is caused by industries of larger, more developed countries. The costs of building resistance against floods was becoming greater for a country that only had a GDP of 12.2 million dollars, and the country's wealth will be relatively short lived considering a huge portion of Tuvalu's GDP in 2006 came from the selling of its appealing Internet code, ".tv". Toafa aims to put pressure on the United Nations through positioning itself as the conscience (or pest) of climate negotiations. His strategy is to badger the UN to push for increase adoption of the Kyoto Protocol . Islanders can either abandon threatened areas, retreat to higher grounds, or build walls to hold back the sea. Some islands have already built floodwalls to protect more heavily populated areas. However this resistance strategy costs a decent amount of money; the island of Male spent US$4,000 per meter for a system of protective walls around the capital . Though this project was largely funded by Japan, it is not certain whether all South Pacific Islands will receive enough foreign aid to compensate for the costs. Seawalls are also not very effective in Tuvalu; most are damaged and are in urgent need of repair . New Zealand has offered to accept more Tuvaluans, although capping the immigration a 75 persons per year as part of a labor program . Despite reports that evacuation of Tuvalu is already underway, very few are going. Tuvaluans have mixed reactions about the flooding and tide changes. Though the concern is high, many refuse to talk about climate change while others see it as a less important issue than waste disposal or overpopulation. Tuvalu also wants to discuss immigration policies with Australia and New Zealand as a safety net in the event that evacuation becomes a reality . Ideally, Tuvalu would like to buy land from New Zealand or Fiji to resettle the entire nation. However relocation proves to be a larger problem in terms of culture lost. On the other hand, it seems that Tuvalu may not have many options if present conditions continue to worsen - many scientists are predicting that Tuvalu and other small South Pacific islands will be completely submerged within the next 50 years. Citizens of Tuvalu agree that if relocation becomes a necessity, they wish to live on another island that will allow them to maintain their oceanic culture . In 2005 the island states called for an international meeting in Mauritius, which introduced a ten-year action plan for island nations called the Barbados Program of Action (BPOA). The strategy lays out a detailed agenda focused on climate change issues, sea level rise, natural disasters, waste management, water resources, and other concerns. Interested participants in the effort would become stakeholders through providing economic assistance to the development of addressing the aforementioned concerns. This plan attempts to unify the international community and the island nations to combat global warming and its effects as a whole . 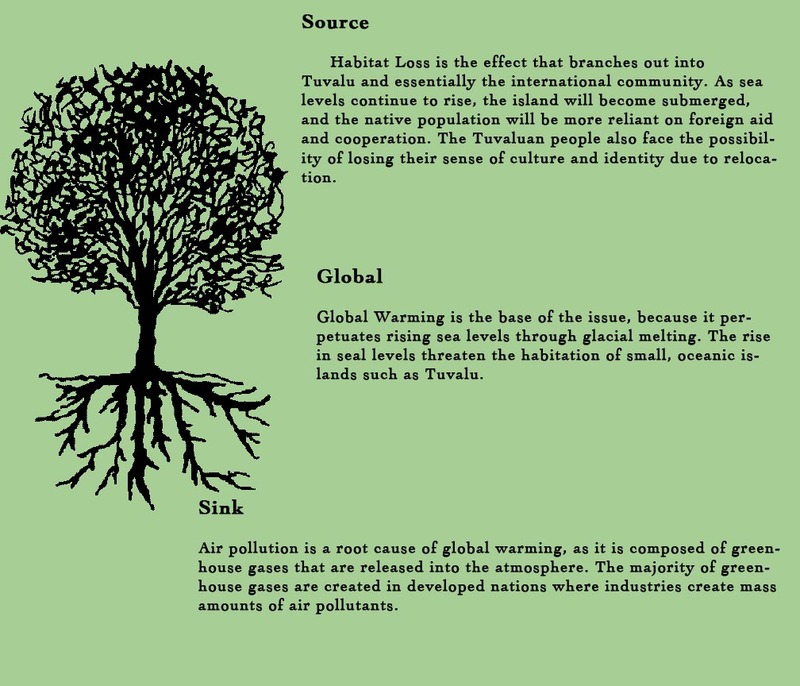 To analyze Tuvalu's environmenal isue, the global, sink, and source problems will be shown in a problem tree. The problem tree consists of the roots of the tree (root causes), the trunk (main problem), and the branches (effects). The future of Tuvalu is effectively threatened by the forces of climate change. However, detailed graphs and scientific studies show that sea levels around Tuvalu are not rising significantly enough to impose a direct threat. Forecasts are prediction sea level rises of about 1.5 mm per year, which would put the sea level at about 7.5 cm (almost 3 inches) in 50 years .On the other hand, severe storms and intense tides that were not previously present in Tuvalu are creating major problems for the island. Theories that link these changes in weather and global warming suggest that international attention is needed to address the problem. Tuvaluans still face the possibility of relocation as the island becomes more uninhabitable, due to a variety of internal (habitat loss) and external (weather) forces. There could also be future conflicts between refugees and host countries as a mixing of cultures may cause stress between the nations. Therefore, it is imperative that the global community work towards reducing the effects of global warming through promoting and using alternative energy sources, such as solar or wind power. The lack of response specifically from the more developed countries that produce the majority of greenhouse gases is demeaning, and their actions ultimately decide the fate of Tuvalu. 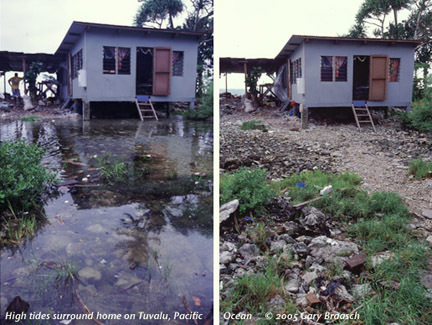 Habitat loss is the main environmental problem in Tuvalu, which is being caused by rising sea levels. Attempting to salvage the island by building it up on supports is not very possible, as Tuvalu does not have the economic capacity to fund this development, and it is unclear whether international aid will contribute to this option. Furthermore, it is not certain whether supporting the island will have any effects on the natural habitat and wildlife, which could cause sustainability issues. Currently, the Tuvaluan government is preparing to relocate its people to neighboring countries. Tuvalu lies within the trade wind zone but on the edge of the South-west Pacific equatorial doldrum zone. Prevailing winds are from the easterly quarter and they occur most frequently between June and August. In most years from December to March, winds between the west and north usually equal or exceed the easterlies in frequency. Wind speeds over the surrounding ocean average about 10kts. Strong winds are not common being experience about 3 percent of the time. Although Tropical Cyclones occasionally develop near to Tuvalu they rarely become hurricane force in Tuvalu waters and cause destruction on land . Temperatures are uniformly high all year round with the mean annual temperature approximately 28 deg C.
Rainfall in the southern Tuvalu atolls is high and reliable throughout the year but less so in the northern atolls. Sixty percent of the rain falls in the November to April period and it is in this wetter season that the heaviest rates are recorded. There is a significant inverse relationship between rainfall and the El Nino/Southern Oscillation Index leading the rainfall response by several months. Most years usually have some months of abnormal rainfall, but high or low rainfalls in the southern atolls are not very common. However abnormally low rainfalls do persist longer than high rainfalls especially in the northern atolls where they can last up to eighth months.The average duration of rainfall on Funafuti is 525 hours per year, or about six percent of the total time. It rains fifty percent more often (317 hours) during the wetter season than during the drier one (208 hours).With the high levels of sunshine evapotranspiration rates are also high, but in most years in the south rainfall is sufficient to meet these requirements. Soil moisture deficits are most likely in the northern atolls . Tuvaluan atolls - mainly Funafuti the main atoll that holds the majority of the population. The conflict is happening within the country. Though it invovles external actors, it is not a necessarily a transnational conflict. Sea level rise threatens the livelihood of Tuvalu and other small islands in the Pacific. Loss of culture, habitat, wildlife and ecosystems are all potential threats as a result of climate change. Since there is an evacuation plan already in process, there is a low change of fatalities and casualties due to sea level rise. However, other natural disasters that may or may not be related to climate change may cause deaths during this period. Thus, the highest potential fatality level is roughly 12,000 civilians. Global warming is still not a proven cause of sea level rises and severe storm activity, though it is the most generally accepted theory. Regardless, climate change is not a direct impact on the conflicts, as it creates other issues which in turn creates conflict. Furthermore, many of these consequences are future predictions. For example, it is possible that Tuvalu may clash with New Zealand and Australia on future relocation discussions. Currently, there is internal conflict within Tuvalu over population growth, inadequate resource management, and the issue of resettlement in a foreign country. 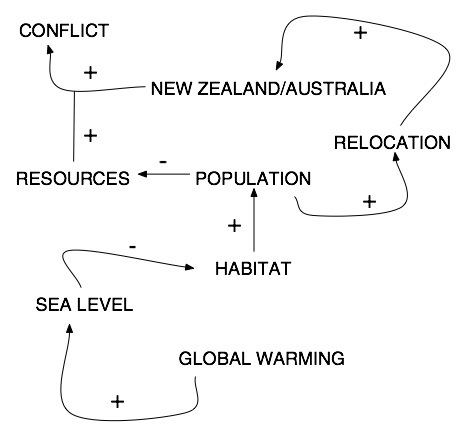 Therefore, conflict is the potential, indirect outcome of global warming. Climate change is a global impact where all countries producing greenhouse gas emissions are responsible for the retributions of global warming. The Northwest Passage is a relevant case that can be used to predict future outcomes of Tuvalu. In both scenarios, the countries experience the impacts of global warming in terms of habitat loss, and both cases highlight the issue of resource depletion as a potential conflict. 2. Connell, John. "Losing Ground? Tuvalu, the Greenhouse Effect and the Garbage Can", Asia Pacific Viewpoint, Vol. 44, No. 2, August 2003. 3. Connell, John. "Losing Ground? Tuvalu, the Greenhouse Effect and the Garbage Can", Asia Pacific Viewpoint, Vol. 44, No. 2, August 2003. 12. Schmidt, Charles W. "Keeping Afloat: A Strategy for Small Island Nations", Environmental Health Perspectives, Vol. 113, No. 9, September 2005. 13. Patel, Samir S. "Climate Science: A Sinking Feeling", Nature, Issue 440, pp. 734-736 (6 April 2006). 14. Patel, Samir S. "Climate Science: A Sinking Feeling", Nature, Issue 440, pp. 734-736 (6 April 2006). 15. Schmidt, Charles W. "Keeping Afloat: A Strategy for Small Island Nations", Environmental Health Perspectives, Vol. 113, No. 9, September 2005. 16. Schmidt, Charles W. "Keeping Afloat: A Strategy for Small Island Nations", Environmental Health Perspectives, Vol. 113, No. 9, September 2005. 17. Schmidt, Charles W. "Keeping Afloat: A Strategy for Small Island Nations", Environmental Health Perspectives, Vol. 113, No. 9, September 2005. 18. Patel, Samir S. "Climate Science: A Sinking Feeling", Nature, Issue 440, pp. 734-736 (6 April 2006). 22. Patel, Samir S. "Climate Science: A Sinking Feeling", Nature, Issue 440, pp. 734-736 (6 April 2006). 23. Schmidt, Charles W. "Keeping Afloat: A Strategy for Small Island Nations", Environmental Health Perspectives, Vol. 113, No. 9, September 2005. 24. Schmidt, Charles W. "Keeping Afloat: A Strategy for Small Island Nations", Environmental Health Perspectives, Vol. 113, No. 9, September 2005. 25. Patel, Samir S. "Climate Science: A Sinking Feeling", Nature, Issue 440, pp. 734-736 (6 April 2006). 26. Patel, Samir S. "Climate Science: A Sinking Feeling", Nature, Issue 440, pp. 734-736 (6 April 2006). 27. Patel, Samir S. "Climate Science: A Sinking Feeling", Nature, Issue 440, pp. 734-736 (6 April 2006). 28. Patel, Samir S. "Climate Science: A Sinking Feeling", Nature, Issue 440, pp. 734-736 (6 April 2006). 29. Schmidt, Charles W. "Keeping Afloat: A Strategy for Small Island Nations", Environmental Health Perspectives, Vol. 113, No. 9, September 2005.